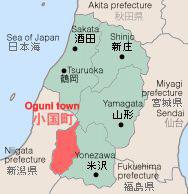 Oguni-machi is situated at the south-west tip of the Yamagata prefecture. It is next to the prefectural border of the Niigata prefecture. It is situated in the middle of both prefectures' capital(about 80km from Yamagata-shi and from Niigata-shi). Embraced by the IIde - Asahi mountain range, the total area is 737.55 square kilometers. Approximately 90% of its territory is covered by a forest mostly containing broad-leaved trees like the Japanese beeches. The beautiful changing seasons can be enjoyed all year. In addition, it is one of the country's heaviest snowfall areas. With the Japanese Beech tree and the snow acting as its symbols, this town is often referred to as shiroimori(white forest).